The new Rigging and Lifting Operations procedure was created to enhance the performance of lifting operations on all Noble assets. The sheer volume and criticality of lifting operations warranted a thorough review of how this type of work is approached and executed. The new procedure combines updated regulatory requirements with industry and Noble best practices that help employees plan and conduct lifting operations in a safe manner that will set them, and Noble, up for success. To begin with, it was imperative that enhanced access to training became mandatory. By creating multiple levels of training for our workforce, Noble is providing the opportunity for formalized skill development to go along with on-the-job training. To supplement training, a nine question Pre-Lift Pocket Card Checklist has been provided for reference as the baseline for every lift that is made. A Lift Categorization Flowchart, containing criteria for assigning each lift as General, Complicated, or Critical, has also been incorporated as a guideline that ensures appropriate measures have been taken into consideration for each lift. In addition, a new template has been developed to allow employees to document their lift plans and execute an in-depth assessment of the varying factors associated with each lift. 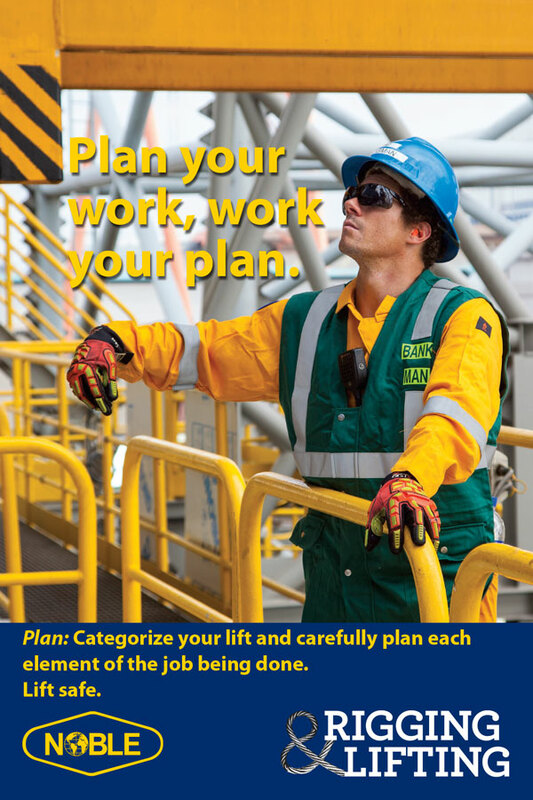 The goal is to provide our employees with all of the tools necessary to carry out lifting operations in the safest manner possible while protecting people and assets. This procedure provides the guidance and structure for achieving this goal. We will continue to build upon this framework by incorporating the feedback we receive from the field as we seek continuous improvement of our policies and procedures.